A view of the interior of the server. 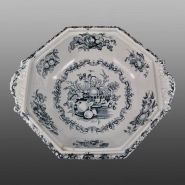 A large octagonal shape stoneware covered server printed in an unusual blue-black pattern named Fruit Basket. The pattern name is included in the printed mark as shown above.